A unique style of mug with a wider base, elegant handle. These 16oz, Bright White mugs are decorated by hand and each mug features a Salmon. 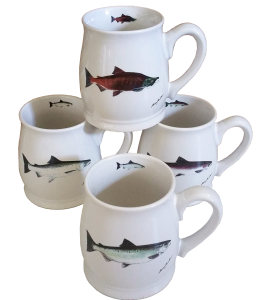 Together the set includes a Silver, Sockeye, Steelhead and King) one of each per mug, original artwork Dann Jacobus.